Surprise Me! Secret Santa Gift Exchange is a gift exchange/swap for bloggers. 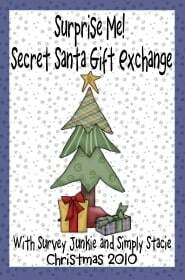 Each participating blog will be a Secret Santa & also receive a gift from a Secret Santa. There are No Sponsors for this event, it’s just like one big office party. After you receive your gift you can tell everyone all about it on your blog. Each Secret Santa will spend $15 on their gift. This can be one item or multiple items that total $15. We want everyone to enjoy the swap and their gift so we have added category choices for you to choose from on the sign up. This way it helps the Secret Santa have an idea of what you like and so that everyone enjoys their gifts. Sign up will be open for 2 weeks and will end on Wednesday October 6th. If you are interested in participating in the Secret Santa Gift Exchange simply fill out the form and we will add you to the list. Where to ship gift to..
We will email you updates, shipping deadlines and all other information needed after the list is closed. I copied and posted about it on my blog, I made sure to say that it was info from your blog. I have a really bad cold or I would try to post something myself in my own words, I’m sorry. That’s fine! Thanks for spreading the word. YAY!!!! This sounds like a lot of fun, Cant wait! I’m in!! I love swaps! I filled out the form, but it won’t let me add myself to the Mr. Linky. I tried on both original blogs. It lets me get the code, but not add my name to it. Please let me know if I’m doing something wrong. That’s ok! We will be adding you in the blogs to the linky. I just signed up and posted. This sounds like fun! Yay! I wanna join. I filled out the form and can’t wait. Awesome idea! I can’t wait to see how this goes. I just did my post for it. Sounds like fun!! I’ll get my post out tonight! This is fantastic!!! I am so excited and happy to be a part. I just posted about it on my blog. great Idea… I have signed up…. Hi! Sound so fun!!! I cant add to the linky?? Not sure why, but I really want to do this! As usual Stacie you are out ahead of the crowd. Great to be part of your events. Sounds like fun!!! Can’t wait!! Placing the post on my blog too!! I’m not a blogger but it sounds like fun! This is a great idea. Have fun everyone! I signed up I am not a blogger but was sent by Mommy Katie! Can’t wait it is a great idea! I also posted it on my FB and twitter! Awesome idea. Can’t wait to go shopping. Oh me, me! I definitely would like to join. Thanks to Mary of Boo’s place that I read about this. This is an awesome idea. I’m so excited! I signed up and posted. Can’t wait. Sounds like fun, I’m in! You always come up with the coolest ideas! I signed up and will now go grab the button. I can’t wait! It’s been so long since I got to participate in a swap. I just signed up! I’m just getting my blog started..I’m a newbie lol! I just signed up and will be spreading the word on my blog! I’m glad that my SIL told me about this today, or I would have missed on joining in. Thanks for hosting this fun swap! I just signed up! Sounds like it will be lots of fun! Just submitted my form and now I’m going to go blog about it!! Super fun idea! Its almost time for the fun!!!! I cant wait to do the exchange,i love Christmas.